Click the "Import Tasks" command on the File menu. 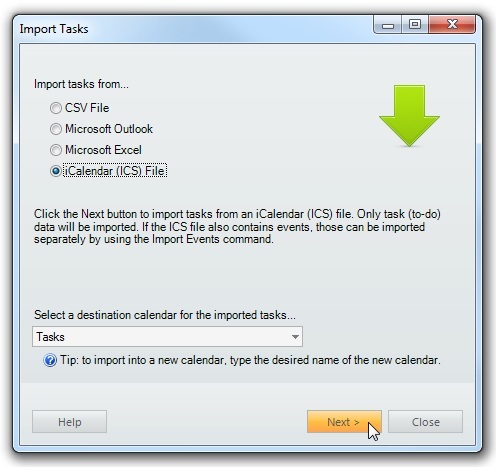 Right-click the Calendar List and select "Import Tasks" from the popup menu. Tasks can be imported from CSV files, Microsoft Outlook (2003 or later), Microsoft Excel (2003 or later), and iCalendar (ics) files. After selecting the desired import source, click the Next button. The imported tasks will appear in the Task List. Tasks that have due dates will also appear in the Calendar View. An existing tasks calendar can be selected from a drop-down list. To import into a new calendar, type in the desired calendar name. The destination calendar will become the owner of any imported tasks. After specifying the destination calendar, click the Next button. When importing from a CSV file, a file browser will be shown, where you can locate and select the CSV file to be imported. 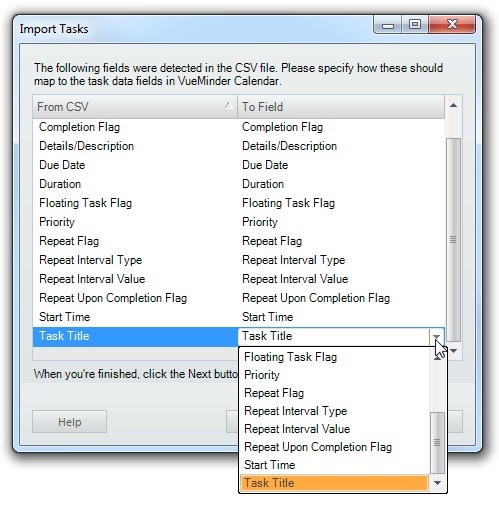 After selecting a file, the window will update to list the fields detected in the CSV file and enable those fields to be mapped to equivalent fields in VueMinder. Some mappings will be automatically filled in, if VueMinder recognizes the source field name. If the source field name is not recognized and the Ultimate version is being used, the destination field will be a new custom field and highlighted yellow to indicate a custom field will be created. To specify or override a field mapping, select the desired "To" field from a drop-down list. To remove a mapping, select the blank entry at the top of the drop-down list. See below for a listing of supported field names. When you have finished specifying the field mappings, click the Next button. The task data will be imported. If tasks already exist, they will be updated instead of duplicated. After the import completes, a list of updated or added tasks will be shown. 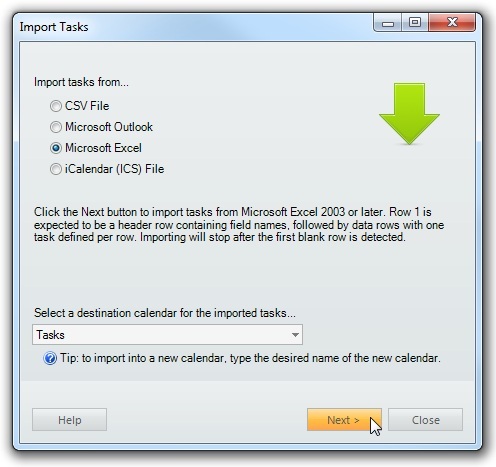 To import from an Excel workbook, select Microsoft Excel as the source and click the Next button. The tasks need to be on the first worksheet within the workbook. Also, the first row is expected to be a header row containing field names, followed by data rows, with one task defined per row. Importing will stop after the first blank row is detected. After clicking Next, a file browser will be shown, where you can locate and select the workbook file to be imported. After selecting a file, the window will update to list the fields detected in the workbook and enable those fields to be mapped to equivalent fields in VueMinder. Some mappings will be automatically filled in, if VueMinder recognizes the source field name. If the source field name is not recognized and the Ultimate version is being used, the destination field will be a new custom field and highlighted yellow to indicate a custom field will be created. To specify or override a field mapping, select the desired "To" field from a drop-down list. To remove a mapping, select the blank entry at the top of the drop-down list. When you have finished specifying the field mappings, click the Next button. The tasks will be imported. Existing tasks will be updated instead of duplicated. After the import completes, a list of updated or added tasks will be shown. The following "To Fields" are supported. Most of these are optional. The only field that must be present is "Task Title". Also, since these fields might not be applicable to every task, you can leave the value blank to have the field ignored for a particular task. Task Title – The task title text. Description – The task details/description text. This is plain text, but can include HTML tags. Category – The task category. If there are multiple categories, separate them with semicolons. Example: "Work; Important; Follow-up"
Calendar – The Task calendar. 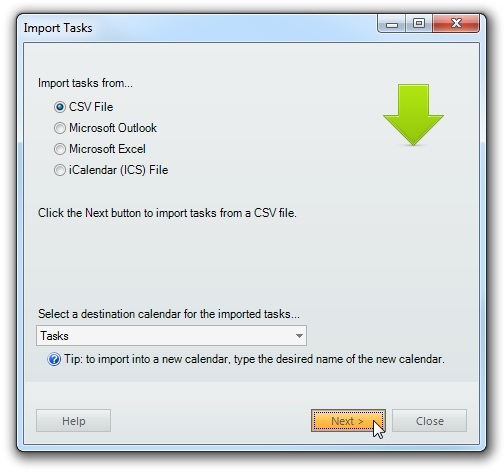 If not specified, the imported task will be assigned to the "Destination calendar" selected in the Import window. Otherwise, this will override the selected destination calendar. Priority – The task priority. Example: "High". Due Date – The task due date. Leave blank for tasks that have no due date. Start Time – The task starting time of day. The format should match the date/time format used by Windows, based on your regional settings. Leave blank for tasks that don't have a starting time. Duration – The duration of the task. It should be formatted as "N span", where N is a number and span is "minutes", "hours", "days", "weeks", or "months". Example: "30 minutes". Completion Flag – When this flag is set to a value of "X", "yes", "true", the task will be marked as completed. Repeat Flag – When this flag is set to a value of "X", "yes", "true", the task will be repeating. Repeat Upon Completion Flag – When this flag is set to a value of "X", "yes", "true", the task will repeat upon completion instead of original due date. Ignored if the "Repeat Flag" isn't set. Repeat Interval Value – The numeric value used to control how often a task should repeat. Ignored if the "Repeat Flag" isn't set. Repeat Interval Type – The repeat interval type. Can be set to "Days", "Weeks", "Months", or "Years". Ignored if the "Repeat Flag" isn't set. Note, this requires Outlook 2010 or later. Also, tasks will be imported from the default "Tasks" folder and any of its subfolders. If you store tasks elsewhere, they will need to be moved into Outlook's "Tasks" folder before importing. The "Folder List" view in Outlook can be used to accomplish this. After clicking Next, the import process will begin. 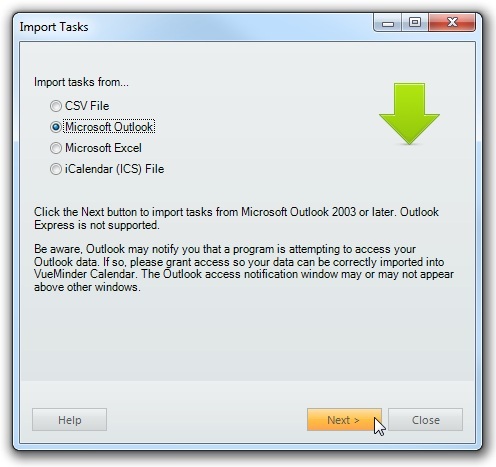 Depending on the number of tasks stored in Outlook, this could take between a few seconds to several minutes. After the import is completed, a list of updated or added tasks will be shown. After clicking Next, a file browser will be shown, where you can locate and select the ICS file to be imported. The ICS file will be processed to import any VTODO entries. Many ICS files don't contain VTODO entries, so those will need to be imported as events. A summary of the imported tasks will be shown when the import is completed.